Gallia Academy High School athletic director Adam Clark, left, joins GAHS girls varsity soccer coach Leah Polcyn for a photo as the Blue Angels open varsity soccer for the first time in school history during the 2018-19 school year. CENTENARY, Ohio — Evening the playing field. 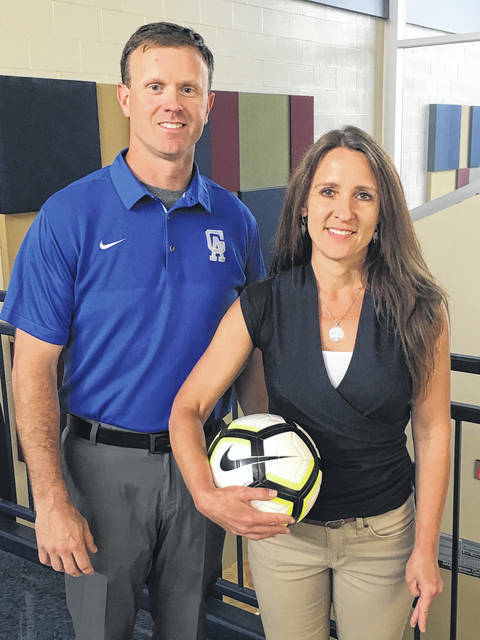 In 2001, Gallia Academy High School started up a boys soccer program at the varsity level — giving its student-athletes a chance to participate in the world’s most popular sport. The proverbial catch, however, was that the program served in a co-ed capacity, allowing both boys and girls to compete on the same team — against other schools that primarily used an all-boys roster. The Blue Devils have had their fair share of accomplishments during that 17-year span, with some significant contributions coming from the female members of those squads. Now, the ladies have a chance to make their own mark, their own history, and their own memories, as Gallia Academy will be ushering in a varsity girls soccer program at the start of the 2018-19 school year. The Blue Angels already have an official head coach in Leah Polcyn, who has served as the ninth-grade English teacher in the Gallipolis City Schools district over the last eight years. She has also served in a volunteer role with the current GAHS soccer program over the past few seasons. Polcyn — who competed as part of the Olympic development program during her playing career — is excited to be part of this historic endeavour at GAHS, mainly because of the potential that comes with promoting a sport dear to her heart while also providing an opportunity for these girls to shine. There’s a big first step coming, as Polcyn acknowledges, but she is humble to be in this position … and plans on making the most of this chance. Soccer has grown in interest over the last two decades, both nationally and locally. Gallia Academy has gradually grown from a varsity-only boys squad into a program that now has enough interest for both junior varsity and junior high teams. Those numbers, however, have also occurred in a boys’ division, which meant that the handful of girls competing were good enough to keep up with bigger, stronger, faster players of the opposite gender. Having some of those girls to work with in the first season will really be a big plus, but Polcyn is more focused in getting as many soccer-minded players out for the 2018 campaign … mainly because she believes that the best programs are the ones that come with depth. In the early stages of gauging interest, Polcyn believes that some of the girls that haven’t played in a few years might be skeptical of coming out for soccer again. But, as she notes, it doesn’t matter how long you’ve gone without playing the game. If you miss the game and like playing it, here is your chance to play on an even keel. “The biggest thing I’ve ran into so far is that we have girls that have been playing on the varsity, junior varsity and junior high teams, but there are also girls that played all the way through grade school and then couldn’t compete at the boys’ level well enough to stay involved in the game,” Polcyn said. “It will help that we have some experience coming into our first varsity season, but it also provides another chance for those girls coming out of sixth-grade to have somewhere to go in this game. Athletic director Adam Clark is also pleased with the addition of girls soccer to the Gallia Academy varsity athletics family. As he says, it’s just another chance for the student-athletes to succeed under a very qualified teacher of the game. Polcyn enters her first season as a varsity head coach with the luxury of knowing what these girls are about to embark on, having been part of the first girls soccer team at her alma mater. Polcyn also admits that she still feels connected to that program because of what she endured during her prep career … and that’s something that will now be available for the girls at Gallia Academy. The girls soccer program is also lucky to have a soccer-only facility waiting for it in the first year of existence as the Blue Angels will join the Blue Devils in calling Lester Field home. Polcyn is excited about her home venue and believes it will help in achieving some early goals for the program. The Gallia Academy girls soccer program will be conducting practices on Tuesdays and Thursdays from 8-10 a.m., starting on Tuesday, June 5. All practices will be held at Lester Field.